You will rarely meet someone who has as much zest for life as Sue. Her positive attitude, energy and enthusiasm are contagious. 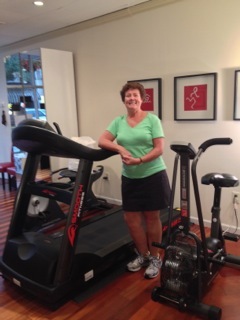 She is a committed endurance athlete and also serves as a coach for local running classes for adults. Sue is the ultimate team player, and we feel so lucky to have had her as a patient. I had a nasty right ankle sprain after my foot got caught in a rabbit hole in the grass after a race. I heard the tear, experienced immediate swelling, saw stars and almost passed out from the pain. told me I could bike and swim but no running/walking. Hearing that I was able to still do something active was huge mentally because I was training for my 1st Olympic distance triathlon. The physical benefit came within 2-3 weeks of starting treatment. The swelling and bruising improved, discomfort lessened and the ability to put weight on my foot was so much better. Dr. Mayes transitioned me to more walking, then running, always keeping an eye on my foot and listening to my subjective symptoms. What would you recommend to someone who has the same injury?
. Starting therapy/treatment immediately is critical to a full and rapid recovery. Work with someone who you trust...I have complete faith in Dr. Mayes which helps the whole process. What activities are you most excited about getting back to? I was happy to get back into marathon training using the run/walk method and being fully recovered. Yes, I did complete my 1st Olympic Distance Triathlon in Washington, DC all thanks to Dr. Mayes and his assistant, Deb. My next goal is to complete my training and finish the Harrisburg Marathon on Nov 10. I will also strive to stay healthy, injury free and fit so that I can complete my 1st Half Ironman in 2014 under the careful eye of Dr. Mayes. Remember life is good & precious, so go outside and play! !